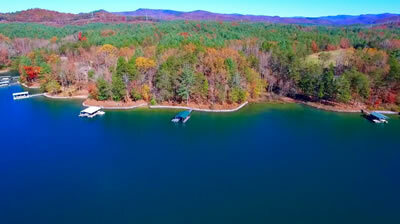 Lake Keowee is known as one of the most prestigious lakes around. Keowee features some spectacular waterfalls, views of the Blue Ridge Mountains, and the most crystal-clear waters around. It is located in the northwest corner of South Carolina and is only 45 miles from Greenville, SC and 125 miles from Atlanta, GA. The full pond elevation is 800 feet and the depth of the lake is 297 ft.It is nestled in the foothills of the Blue Ridge Mountains, which has over 400,000 acres of undisturbed forests. On Lake Keowee you will find some of the largest homes around.As a matter-of-fact, Lake Keowee was listed as one of the DzTop 10 Places to Live and Boatdz in the December 2010 issue of Boating Magazine. The lake consists of 17,660 acres of fresh water with 300 miles of shoreline. It is the first lake that was developed as part of Duke Energy’s Keowee-Toxaway Complex. Fish include: Blue Gill, Rainbow Trout, Brown Trout, Largemouth Bass, Smallmouth Bass, Yellow Perch and Spotted Bass. Rumor has it that there are several famous people who own homes on Lake Keowee, such as Jack Niclaus, Oprah Winfrey, Kevin Costner and Dan Marino. Of course, we cannot verify that information, but it is highly probable that they do have a second, or maybe it’s their third or fourth home, on Lake Keowee.